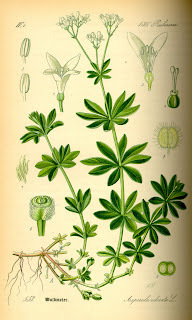 Sweet woodruff (Galium odoratum) is a perennial groundcover generally considered to be hardy to zone 4, although some sources put it in zone 5, while others claim it is hardy to zone 3. There are varying opinions about this plant, from "invasive nuisance" to "beautiful groundcover". In our fourth year of growing this plant in zone 3, I think of it as a wonderful groundcover, although I can see why some gardeners might view it as a nuisance. The tiny clump we first planted has now spread to cover a large area, and although it's taken over a couple of sweet peas planted from seed and a delicate alpine plant that was failing anyway, we have high hopes that it will beat out the lilac suckers that come through our fence from our neighbours' yard. In short, it is a thick groundcover, about 15 cm tall, that easily crowds out weeds. However, the roots and spreading stems are quite shallow, so transplanting and controlling the spread of this plant are both fairly simple. Although it isn't too picky, it seems to prefer some sun to full shade in cold climates, and appreciates some amendments to the soil before planting. Although this plant grows very well for me in my backyard garden, I have killed some by transplanting it in front of our house. I also gave some to a relative in Calgary (also zone 3), in whose shady bed it never really took off. However, a stem that appeared to have no roots that my three-year old "planted" in our newly dug and amended front garden this year is actually growing and flowering. I believe that this plant will grow well in our area, as long as it gets a little sun, a little TLC before planting, and good snow cover over the winter. Besides crowding out the dandelions and chickweed, what else is this plant good for? Even during our cold winters, it often emerges from the under the snow with some green growth, giving it a good head start when your garden needs it most. The tiny white flowers appear in clusters above the leaves in the spring, giving it the alternate common name "wild baby's breath". In a large clump or mass, the display is very pretty, and the plants sometimes rebloom in summer. The tiny flowers are also sweetly scented, and stems will last about a week in a glass of water. An established clump can also supply plenty of flowers to pick even for very enthusiastic children, without showing the bare patches. And the foliage itself also smells wonderful and may repel moths when it is dried, making it a good ingredient in homemade potpourri. That's interesting. I put in some sweet woodruff (tagged Zone 5) in a shady spot in 2006 in Edmonton. It did well in 2007, spreading widely, but declined in 2008, almost disappeared in 2009, and now I've got but one or two shoots. It recovered somewhat in the summer, and seems to survive under the snow cover fine, but once the snow is gone, the Spring frosts knock it back. Maybe I should transplant the few surviving sprigs somewhere sunnier. In contrast, and I guess not surprisingly, the native Galium boreale has been doing fine and I'll probably have to start weeding it soon. Dave, I do have mine in quite a protected area. It seems to thrive once it finds a spot it likes, but not do well in some areas. Middle Earth, we've only had our sandbox for a year, but so far the sweet woodruff seems able to handle lots of sand on top of it. We'll see what happens as it works its way down into the soil! I live in Telluride, CO which is in the San Juan Mountains. I think the elevation here is almost 10,000 feet. I think we are considered a zone 2 or 3. The sweet woodruff I have planted has done very well. I planted in area that is almost full shade and very moist where not much else would grow. It has done very well over the years. I Like it for the reasons you mentioned above as well as it doesn't require much. I don't even have to apply mulch in winter but maybe snow helps insulate it. Hello Cassandra, I'm writing a column article about woodruff (Waldmeister), which means so much in May celebrations for Germans. Might I use the old biological table you use for its illustration, please? I'd name your website as the source … Thank you!